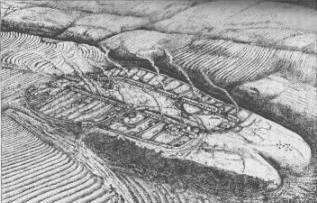 West Whelpington as it may have appeared in the early 15th century. 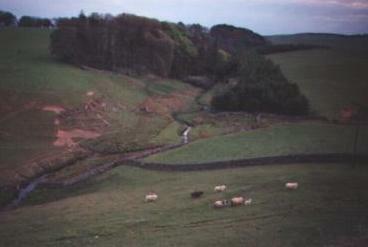 The deserted village of West Whelpington lies to the South East of the farm steading. The village was deserted between 24th August 1719 (mention of baptism of Anne, daughter of Henry Crenstone) and 1721. The Stott family seem to have been partially responsible, as well as the enclosure of Kirkwhelpington. The ridge and furrow is very evident when snow covers the area, evidence of the open-field agriculture. 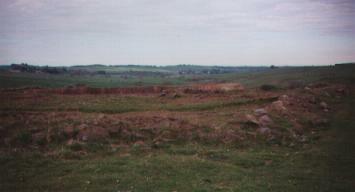 The site was excavated by Professor M.G.Jarrett from Newcastle University, we hold all the data on the site. The river Wansbeck rises at the boundary of our land and Crookdene farm. The settlement of West Whelpington is on the hill top above this point.